ANNAPOLIS, Md. (AP) — The curator of the U.S. Naval Academy Museum wasn’t exactly sure what would be found: records indicated five display boxes long used to exhibit captured British flags from the War of 1812 actually concealed more banners underneath. But not until all 61 banners were painstakingly removed in December for a conservation effort did curator Charles Swift, who is also the museum’s managing director, actually see what was hidden. And he was gratified to learn that conservationists had uncovered dozens of other flags — many captured by the Navy in other conflicts of the 19th century. The 46 newly discovered flags — including banners from battles in Asia and from the Spanish-American War — had originally been put on display in 1913. But seven years later, they were covered up by the 15 flags from the War of 1812 — and sealed up for nearly a century. No one alive had seen the flags long hidden from view. The flags, covered by the others in boxes with large plate-glass lids, speak to an earlier era of U.S. intervention overseas. They include one taken from a Chinese pirate fort off Macau dating to 1854 and another captured in Korea in 1871, according to Swift. There were even some replicas of Revolutionary War-era flags among them. He said no one had attempted to open the boxes for so long until it came time for needed conservation. In 1849, then-President James K. Polk designated the academy in Annapolis, Maryland, as the repository of flags captured in battle by the Navy. 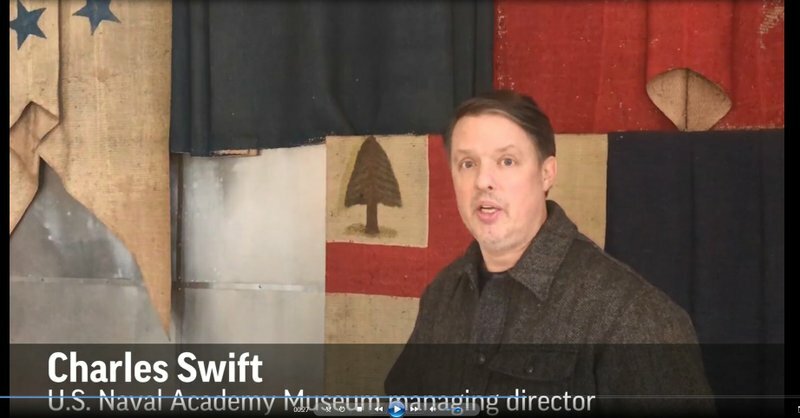 The museum is now home to about 800 flags and trusted with their conservation, Swift said. About 250 of them are trophy flags seized in battle. The museum also houses seafaring instruments, naval uniforms, medals, photographs, art and items recalling past naval expeditions and explorations. “We are ultimately stewards of these objects that tell important stories,” said Swift, whose museum boasts more than 100,000 visitors a year. Amelia Fowler, a well-known flag preserver who restored the original Star-Spangled Banner in 1914, was contracted in 1912 to conserve the academy’s collection of trophy flags. She worked with dozens of other women in the museum’s Mahan Hall, using a patented stitching method to help preserve the fabric. All told, they stitched up enough flags to cover two football fields, Swift said. Camille Myers Breeze is working on a new conservation process for the flags as director of an independent conservation studio, Museum Textile Services, based in Massachusetts. She said Fowler’s work has enabled her crew to handle the flags without risk of damage. Swift said funding for the conservation, about $40,000, came from the U.S. Naval History and Heritage Command, which is tasked with preserving artifacts, documents and other items of that military branch.